Cecilia Rosales, MD, MS, associate dean of Phoenix Programs and professor of public health at the University of Arizona Mel and Enid Zuckerman College of Public Health, and members of the advisory board for the National Ventanillas de Salud (Health Windows) program, received the Ohtli Award from the Mexican Government for improving the quality of life for low-income and immigrant Mexican populations in the United States by improving access to basic preventative health services. 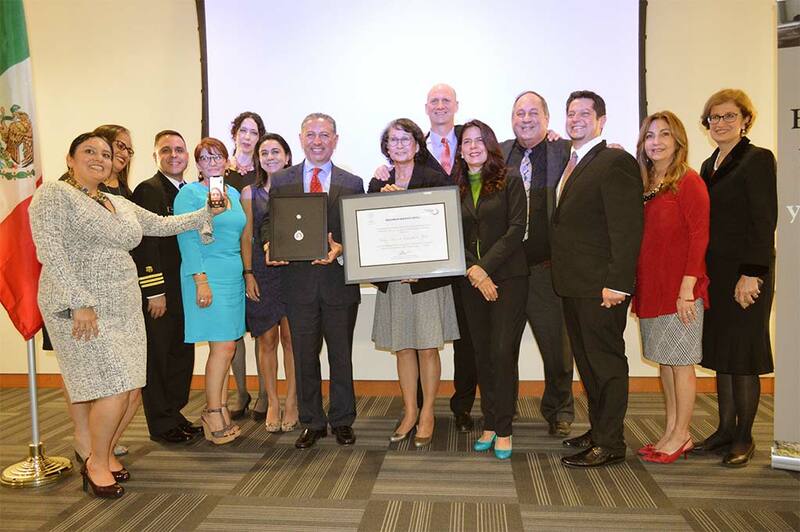 The highest recognition granted by the Mexican Government outside of Mexico, the Ohtli Award is given to individuals and organizations who have aided, empowered or positively affected the lives of Mexican nationals in the United States and other countries. The ceremony was held at the Mexican Consulate in San Diego, Calif., in November. Since 2016, the Ventanillas de Salud (VDS) Mobile Health Unit program has been providing free preventive health services to the uninsured and underinsured. Today, the program has 11 Mobile Health Units in Chicago, Dallas, Denver, Las Vegas, Los Angeles, Miami, New York, Orlando, Phoenix, Raleigh and Tucson. Dr. Rosales is director of the Mobile Health Unit program in Maricopa and Pima counties, calling it an invaluable asset and a mechanism for reaching a large population of uninsured and underinsured individuals who are unaware and uninformed about available services. “As a U.S.-Mexico border state and a border region with a high concentration of Latinos, it is important to work towards increasing access to health care, health information, health education and referral services, to build a culture of health and healthy communities,” Dr. Rosales said. The members of the VDS Advisory Board are: Michael Flynn, program coordinator, National Institute for Occupational Safety and Health, Centers for Disease Control and Prevention; Francesca Gany, cancer researcher, Memorial Sloan Kettering Cancer Center; Larry Kline, critical care medicine specialist; Raul Lomeli, chairman of the board, SABEResPODER; Guillermo Avilés-Mendoza, international program coordinator, Office of Emergency Management, U.S. Department of Health & Human Services; Sylvia Partida, CEO, National Center for Farmworker Health, Inc.; Cecilia Rosales, associate dean of Phoenix Programs and professor, UA Mel and Enid Zuckerman College of Public Health; Ilan Shapiro, pediatric specialist; Rosa Villoch-Santiago, health systems manager, American Cancer Society.